Entertainer’s Dream! Gated Private Estate with Panoramic Western Sunset and Peak Ocean Views set amidst an operational vineyard, includes a second detached home for guests, caretakers or possible tasting room, Designed for entertaining, this family compound is set amidst a private vineyard on just over 4 acres with vanishing edge, pool. The gourmet kitchen is well appointed with high end finishes, The master suite features a sitting room, grand master bath with soaking tub, and 6 Car Garage with RV Bay. Seller will entertain offers between $1,795,000- $2,095,000. Gated Private Estate with Panoramic Western Sunset and Peak Ocean Views. Designed for entertaining, this family compound is set amidst a private vineyard on just over 2.13 acres with vanishing edge, pool. The gourmet kitchen is well appointed with high end finishes, commercial grade range, pantry, wine chiller and sink. The master suite features a sitting room, grand master bath with soaking tub, large walk in closet, and workout room. 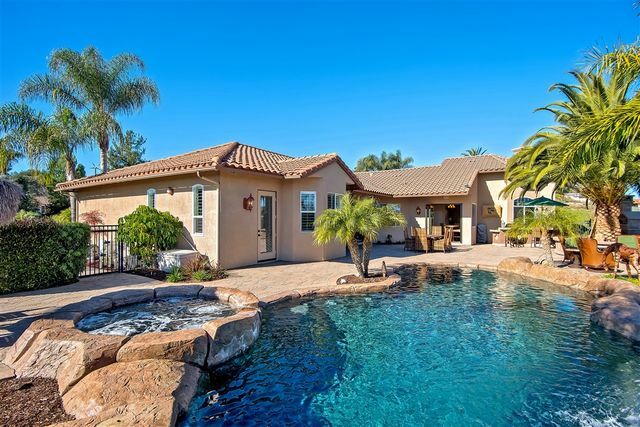 Private office, custom wine cellar, guest casita, 6 Car/RV garage. 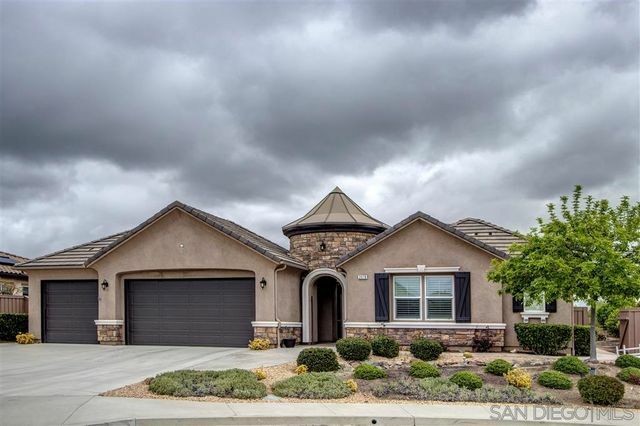 Stunning turn key home in highly desirable area of Strawberry Fields. Gorgeous Canyon views.Truly an entertainers dream w, pool, jacuzzi, waterfall, amazing brick pizza oven, built in fireplace, Bel Guard Pavers, panoramic folding doors that lead to the tropical back yard oasis. RV Parking with 50 AMP plug. Highly updated w/amazing flooring throughout, granite counters in kitchen, remodeled in 2018 state of the art bathrooms, new appliances, wine refrigerator, 2 pantry's, custom designer paint throughout. 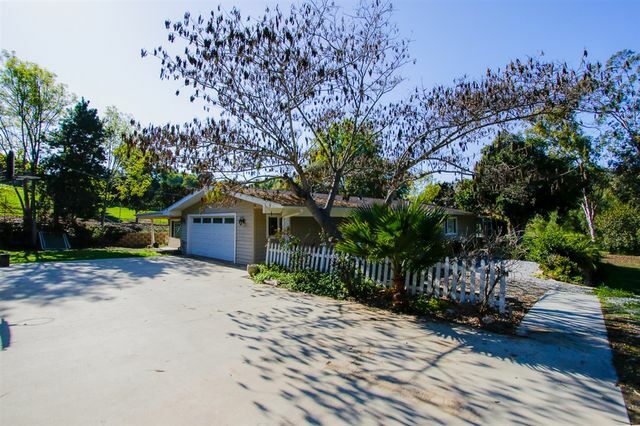 Enjoy the charm of the ranch style home and the quietness of being on a private road in Fallbrook. Here you will find quite a few things have been updated. The following items are new: Kitchen, roof, HVAC system and heat pump, electric washer and dryer, and flooring. The house is wired for solar. The bathrooms have been remodeled and expanded. There is a beautiful pool to relax in that has a new filter and variable speed pump as well. Beautifully maintained single story home in the highly sought after Champagne Crest neighborhood. Situated on a 1.7 ac property, this spacious home is low maintenance with gorgeous views. Expansive open concept kitchen with island seating, granite counter tops, tons of storage space and breakfast nook. Master suite with French doors to back patio and en suite bath with soaking tub, dual vanities and Plantation shutters. Peaceful and private backyard with tons of space to make it your own. Peace and quiet. 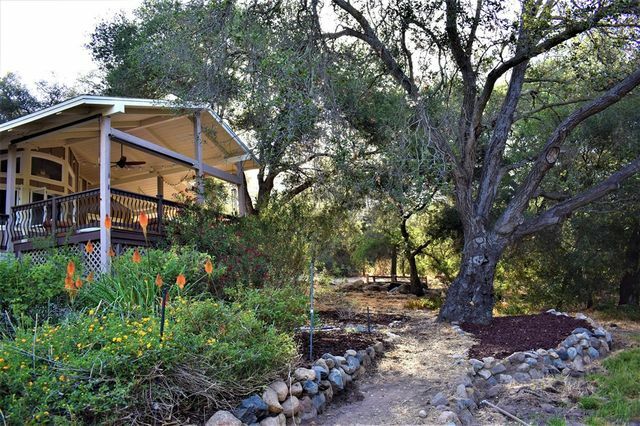 This single level home is nestled amongst ancient oaks at the end of a country lane. This home offers privacy and seclusion even though it is conveniently located. The home boasts a beautiful kitchen with built-in high-end appliances. The distressed, barn wood flooring and two fireplaces create a warm, cozy ambiance. Covered deck for year round outdoor living. 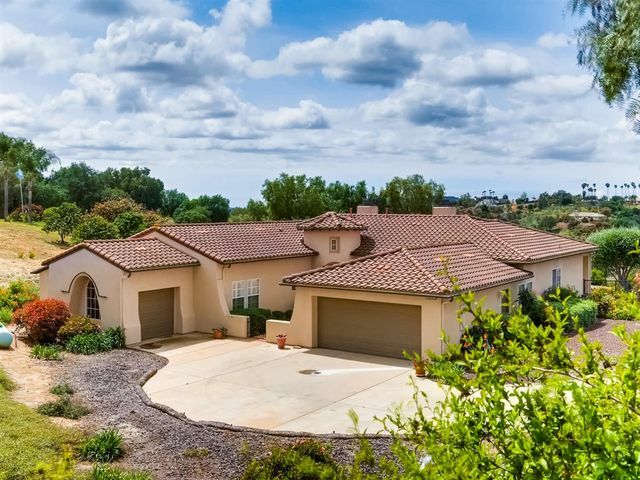 You love this wonderful Fallbrook Estate home. From the front entry, with sight line thru the living room to the back yard and the gorgeous sunsets, this home has it all. The kitchen features a Thermador stainless steel 6-burner range with dual ovens, with ample work space/granite countertops. Formal Living and Dining Rooms look out to the patio with pool and spa, and the delightful sunsets.The master suite features a sitting area, walk-in shower, soaking tub, huge closet. Fruit Trees and Vines, Shed. Wake up to panoramic sunrise views. Perfect condition 1-story home on cul-de-sac in the serene gated community of Shady Grove. Fantastic great room leads to backyard with canyon and mountain views. Beautiful upgrades, open kitchen with huge island perfect for gatherings, 8ft doors, oversized walk-in closet, garage with epoxy flooring. Paid Solar. Fruit trees. 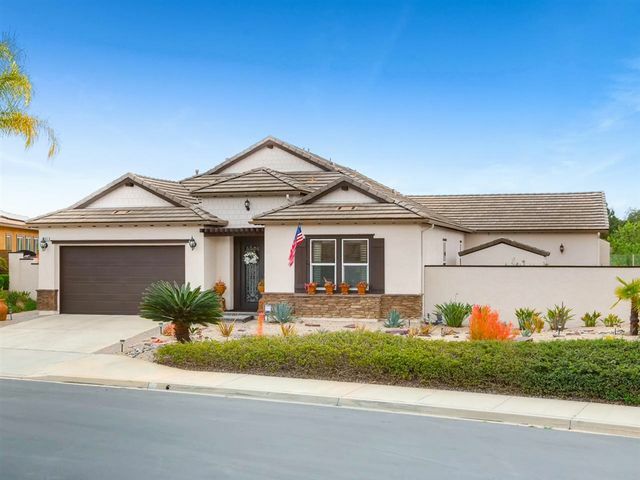 Community boasts tennis & basketball courts, 3 parks, walking trails, playground, RV-Park. Walking distance to school.